The brutal midday sun hammered down on the paddock as strategically umbrella-ed drivers stood about looking aloof and the flags atop the grandstand danced a crazily drunken tango, the wind whipping them into erratic gyres and promising a boatload of mischief for the remarkably cantankerous and aerodynamically sensitive beasts about to be plunged into the heat of battle. Ferrarista's were out with the diagnosis of yesterday's ills, namely a reliability concern forced the turning down of PU's and removal of downforce to counterbalance the loss of power. Mayhaps, and yet the race will inevitably turn, aside from the brutal chaos of attrition, on tyres and tyre management. Pirelli suggesting a 2 stopper as the quickest way around seems a bit of wish fulfillment, as almost all the sharp end will be likely to employ the nearly as fast 1 stopper, which reduces the risk of a disaster in the pitlane. Lights Out!!!! Rocking start from Bottas and he got the jump on Hamilton as behind Ricciardo lost his wing as he tried to squeeze past Perez and wound up on the grass on the inside of the start finish straight. Magnussen nabbed P6 from Grosjean but it was Hulkenberg with the good start in the midfield, up 3 places to P9. Ricciardo was into the pits straightaway along with Kubica. On replay, it was Ricciardo darting up the inside, and winding up on the grass where he hit something hard, that detached his front wing. Yikes! Also present was damage to the barge boards, which was not going to make his life easier as that is one of the more aero sensitive areas on the car. Onto lap 3 and gaps at the sharp end were stabilising at around 1-1.5 seconds, with the sole exception of Verstappen, who was inside DRS on Vettel and pushing the issue a bit. Several laps later and the real crunch in the race was revealed, between Perez in P12 and Gasly in P16. Just to make life interesting Leclerc did a little bit of lawn work, hacking across the grass. Lap 13 and Raikkonen was in and out on a set of Mediums, just in front of Russell, P16 and chasing his teammate 10 seconds up the road. Hulkenberg was next to blink, responding to the undercut attempt from Kimi. The Renault was out on the hards and not the least bit threatened by Raikkonen, who was still several seconds behind when Hulkenberg rejoined. Lap 15 and Vettel was in for a set of Mediums, back onto the circuit in P6, as Kmag also followed Vettel in. That chucked him out into the clutches of Hulkenberg, but Magnussen deftly ran him out of room as the Renault attempted to go round the outside, guaranteed to keep the feud alive for another season. Lap 16 and Hamilton was in, covering off Vettel but it was HAAS again having a balky stop, extra long time with a front left issue and he was out, RoGro just barely in front of Albon and a touch of robust defending required to maintain P14. Lap 19 and the top 3 were Bottas, Verstappen and Leclerc, who had yet to stop. 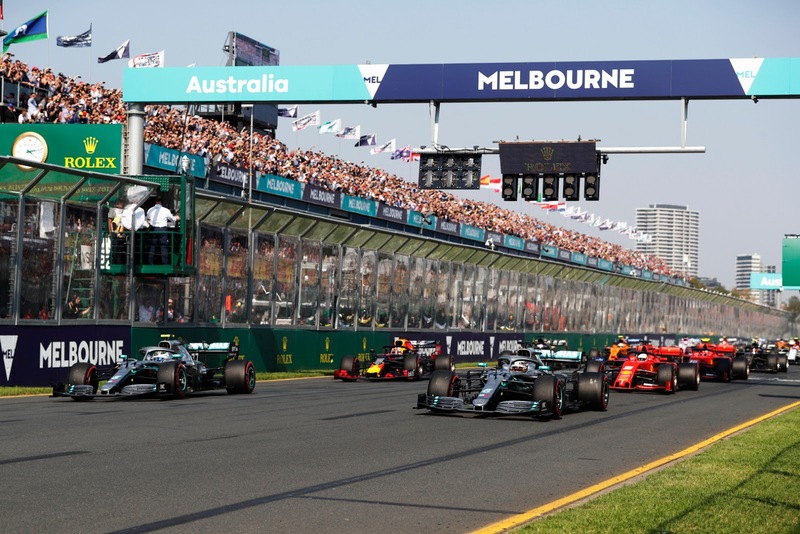 At the front, Bottas was untouchable, having extended his lead to 14 seconds over Verstappen and 26 seconds over Leclerc. Norris was still bottled behind Giovinazzi and quite the train had developed, with Grosjean, Albon and now Perez all in DRS and circling like sharks. Lap 23 and Bottas was in, back out in P2 with a set of Mediums and a nice chunk of cool air to drive into. His teammate was less sanguine, radioing in that he was not convinced he would get to the end on his current set of tyres. Lap 26 saw Verstappen in and off he went onto the Mediums, behind Hamilton and Vettel, but with a 10 lap offset on his tyres and a reputation to uphold. Farther back Norris finally slipped Giovinazzi and half a lap later Grosjean with DRS cruised past as well. This was all to the good as far as Raikkonen was considered, along with Stroll, Gasly and Kvyat who all started on the Medium tyre and ran long. Lap 29 and Leclerc was finally in, and he was onto the Hard tyre, clearly set to run to the end and out in front of Gasly, P5. Bottas was serene in his race, 17 seconds ahead of Hamilton. It was Vettel under pressure as Verstappen had a serious go into the first corner, it wasn't successful, but set him up. Through the next turns the battle went and finally, into T3 the job was done and Verstappen sailed off in search of Hamilton. Lap 32 and the race gods were frowning, first on Ricciardo, who had earlier complained of a developing vibration, and then Grosjean with the loss of the front left wheel, the same one that was an issue in the stop, that ended his day and yet again the harsh environs of Australia did in the dreams of the HAAS teams. Still, the consolation prize for the moment was Magnussen in P7, due to become P6 when Gasly finally decided to pit. Back to Hamilton on lap 34, complaining about the rear going as Verstappen patiently nibbled tenths out of his lead. Lap 38 and Gasly was in and out just in front of Kvyat, who took advantage of cold tyres and went right around the outside and claimed P10. Behind Gasly was Norris and then Perez, all desperate to claim the last, points paying position. At the sharp end, Bottas was now crushing all contenders, 25 seconds up on Hamilton, who was just barely keeping Verstappen at bay. At Red Bull, the strategy looked to be hold your fire and wait for the last 10 laps as the young Dutchman was still chunking about 0.2s a lap from the Mercedes. Interesting gaps, it was 13 seconds from Vettel to Verstappen, but less than a second from Leclerc to to Vettel on lap 51. Apparently, Gasly, too had been waiting because all of a sudden he was right up on the exhaust of Kvyat, applying pressure and beginning to force the him off line. Perez was also getting jumpy and he was squirrelling onto the back of Norris to boot. Lap 52, and Bottas was stating he wanted the extra point on the radio, but his bosses at Mercedes seemed unlikely to let him pit for fresh tyres. Traffic was making that an even more dodgy call, as Hamilton was now inside a pitstop on him and Verstappen was rocking purple sectors less than 2 seconds down on Hamilton. Lap 54 and the tete a tete was furious on the Mercedes pit wall, but at Ferrari a detente cordial had been declared, with Leclerc backing off just as Verstappen rocked off the fast lap of the race. Bottas responded, purpling his sector 1, but with Hulkenberg and Magnussen ahead it looked unlikely for him to finish it off. Magnussen took the honours for Formula B, the only member of the midfield not lapped by Bottas and a salve for the bitter disappointment of Grosjean once again losing his front left wheel and being taken out of what would've been a points paying position. Also feeling the sting was Renault, losing Ricciardo in his home race and the immolation of the Mclaren also perhaps weighing on their conscience a bit. All the midfield that started on the medium tyre benefitted vastly from Alfa playing games with Giovinazzi, as his successful and lengthy defense of Norris locked the early stoppers out of the points positions. But where some lose, others gain and none more so than Kvyat, who, taking advantage of a tentative Gasly, finished ahead of at least one member of the parent team and no doubt a grim satisfaction after being unceremoniously kicked to the kerb a year ago. One wonders as well, what Ricciardo must have been thinking, looking at his former teammate on the podium in his home country. For that matter, one wonders what exactly happened to Ferrari's pace from testing, and the fact that they finished nearly a full minute off Mercedes lends a certain credence to the story that they are suffering from a yet to be fixed issue. But to the victor go the spoils, and it was Valterri Bottas, crushing the field and changing the narrative that looked impressive. Turning massively consistent laps and distancing the field he has established himself as a contender. The only question now is, can he stay one?